Recertification audit according to ISO9001 and ISO14001 successfully completed. 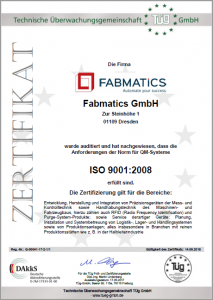 In May 2017, Fabmatics’ quality and environmental management system has been re-audited according to ISO 9001 and 14001 by an official certification body. This test was carried out to the new structures of the companies departments after the merger. Fabmatics succeeded at all points and passed the audit without deviation. With our orientation towards these two standards, we want to continue to perceive this as the optimal and sustainable work for our customers, our business partners and colleagues and for ourselves.